Internet Retailer Conference & Exhibition (IRCE) provides you with a conference full of industry experts, an exhibit hall filled with the latest and greatest solution providers, and a community made for networking with thousands of like-minded industry peers. Developed by the editorial experts at Internet Retailer magazine, the IRCE agenda covers timely topics across the retail sector. 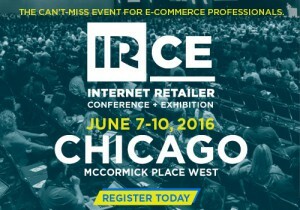 Save 20% Off Registration at IRCE! Main Stage speakers for 2016 include top influencers from Dell, Nasa, Steve Madden, and TigerFitness.com. Don’t miss their inspiring sessions, as well as our 6 dedicated workshops and 10 separate tracks offered across four days. Join IRCE in Chicago, June 7-10, at McCormick Place West, to discover the latest trends in online commerce and improve your online strategies – plus, take advantage of the 600+ solution and technology providers in the exhibit hall. Register now and use Promo Code “AP1” to receive 20% off!